A weekly listing of events put on by professional organizations, educational groups and local chambers of commerce. 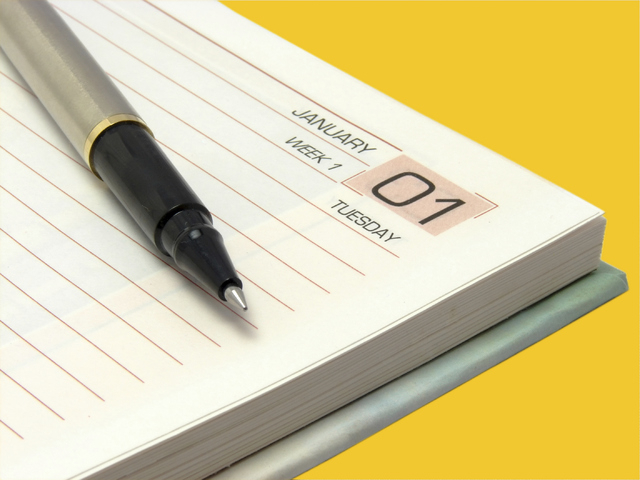 A image showing first January on a diary with pen on isolated color background with fine clipping path. ■ Henderson Chamber of Commerce networking breakfast “Together We Can Feed Everyone” with speaker Brian Burton of Three Square Food Bank. Wingate by Wyndham, 3041 St. Rose Parkway, Henderson. $20 members, $40 non-members. Breakfast and program 7 a.m. to 9 a.m. RSVP at www.hendersonchamber.com. ■ Technology Business Alliance Network luncheon featuring Scott Garrison, president and founder The Integration Center. Fogo de Chao, 360 E. Flamingo Road. $45. Check-in 11:30 a.m., luncheon and program noon. RSVP at www.tban.com. ■ Las Vegas Indian Chamber presents “Changing Landscape of Health Care” with Jerry Reeves, Kelly LeGrow, M. Samar Qamar, Puneet K. Garg and Chris Cochran. Renaissance Hotel, 3400 Paradise Road. $35. 6:30 p.m. RSVP at www.lvicc.org. ■ NAIOP Fall Event: DEALing in Las Vegas…Highs and Lows of Commercial Real Estate Deals. The Orleans Mardi Gras Ballroom, 4500 W. Tropicana Ave. $50 members, $70 non-members. 12:30 p.m. to 7 p.m. For more information, visit www.naiopnv.org. ■ Las Vegas Metro Chamber Mixer at The View inside Palms Resort, 4321 W. Flamingo Road. Free for chamber and Vegas Young Professionals members. RSVP at www.lvchamber.com. ■ Hashtags & Headlines, RJ’s Hot Topic luncheon. Tony Hsieh, Zappos.com founder and former Mayor Oscar Goodman join Review-Journal columnist Steve Sebelius for a discussion on downtown Las Vegas at the Plaza Hotel, 1 S. Main St. $40. Check-in at 11:30 a.m. Contact Melissa McCabe at mmccabe@reviewjournal.com for more information. ■ Nevada Healthcare Forum featuring national, state and local health care speakers, panels and discussions. Tuscany Suites, 255 E. Flamingo Road. $150. 7:30 a.m. to 6:30 p.m. More information at www.nevadahealthcareforum.com. ■ SciTech Hookup Dinner and Showcase event. World Market Center, 495 S. Grand Central Parkway. $150 includes showcase, dinner and program. 4 p.m. showcase, 6:30 p.m. dinner and program. RSVP at www.scitechhookup.org.